Strength of the SPARS . 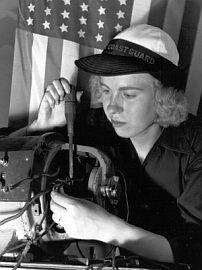 During planning sessions in 1942, the Coast Guard first estimated its requirements for female personnel. 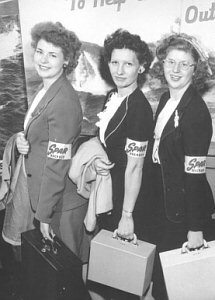 At that time, it was hoped that SPAR strength would reach a total of 400 female officers and 8,000 enlisted women within two years, by April 1944. Women found the allure of Coast Guard duty popular, although the primary combat attraction for American women in World War II remained as nurses, a field that the SPARS did not include. This was because the Coast Guard acquired its combatant nurses directly from the commissioned corps of the Public Health Service . .v The highly selective US Coast Guard paid careful attention to the total feminine qualities of potential woman recruits. 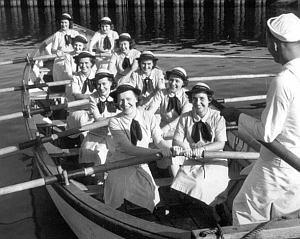 Most women who tried to join the SPARS did not meet such exacting high standards. Wartime records show that tens of thousands applied, but only 11,558 female applicants were found qualified during twelve months from June 1943 until July 1944. Even these highly qualified women had to endure a further difficult screening process that also considered their backgrounds and boating experience. Therefore, of these nearly 12,000 applicants only 62 percent were actually accepted for Coast Guard duty. 5,020 of these women, or about three-fourths of those invited to join, finally enlisted as Coast Guard recruits. Although this number met the first planned Coast Guard needs, District Coast Guard land offices demanded many more women personnel. They were needed to free Coast Guardsmen for sea duty and overseas assignment. The Coast Guard shore establishment found that it took 1.13 Coast Guard people to support each man actually deployed at sea. To insure that this ratio was achieved, the Coast Guard requested an 81 percent increase in additional SPAR personnel at the end of 1943. This remarkable request documents both the high value of the SPARS contribution, and how well the women's reserve was meeting all expectations. 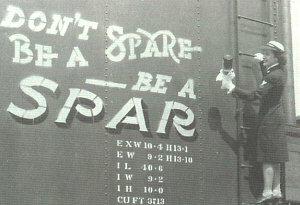 .. SPAR Petty Officer christening a boxcar which bears the recruiting slogan "Don't be a Spare - be a SPAR"
Coast Guardsman as coxswain .. In December 1943, the US Coast Guard announced that it was boosting requirements to 1,200 female officers and 12,000 female enlisted, at a time when there were 489 women officers and 6,103 women enlisted personnel on active duty. By D-Day on 6 June 1944, when the Allies invaded German-held France, the SPARS contained 771 officers and 7,600 enlisted servicewomen. Furthermore, the Coast Guard's medical service was already composed of Public Health Service nurses and even female PHS medical officers on direct combat and shipboard assignments. As of the June 1945, when the Coast Guard had reached a peak strength of 171,168 members (compared to about 29,000 on 7 December 1941 when Pearl Harbor was attacked), 80,476 were actually aboard warships and other vessels. .v In August 1945, the demobilization of the Coast Guard Reserve personnel began and was nearly completed by the middle of 1946. In July 1947, the last SPARS were discharged when Congress terminated the emergency Coast Guard legislation. 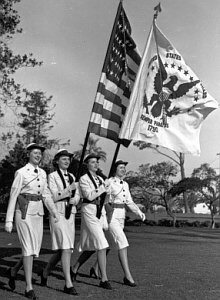 In 1948, the Women's Armed Services Integration established both a regular and reserve status for women in the Army, Navy, Marine Corps and Air Force. 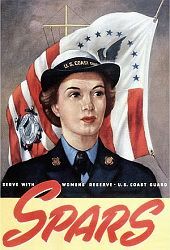 The Coast Guard was not covered by this legislation, but finally its Women's Reserve was re-established and a regular women's corps authorized in 1949. Many former SPARS joined the Regular and Reserve Corps.